The previous meeting of our two subject of Theoretical Linguistics migh be the most memorable classes ever along our 5th week of the vacation. Our beloved lecturer explained us about some linguistic levels: sounds/phone, phoneme, syllable, morpheme, word, phrase, clause, and sentece. Till then we came to the subfield of linguistics and semiotics called: pragmatics. So, besides concern on syntax and semantics factor when we communicate, we also need to notice and pay our attention to the pragmatics. 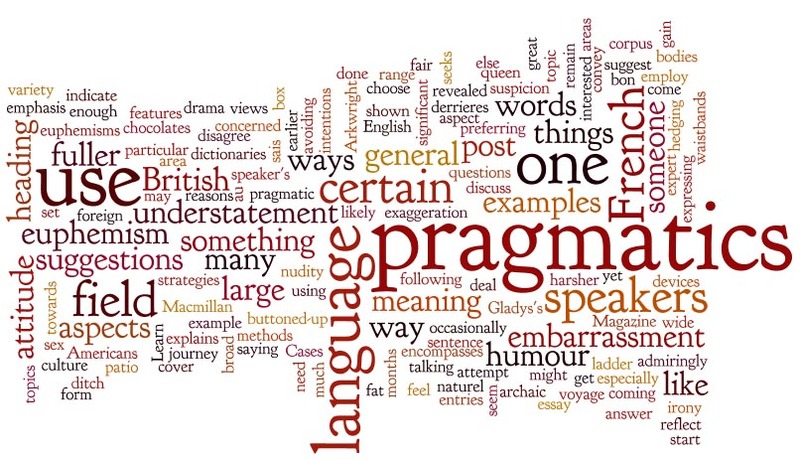 What is pragmatics? It's the study of the ways in which context contributes to meaning. Simply, we can call it as the social context. Learning pragmatics, we are also going to learn about being a wise one. Why? Sure, because to understand certain context of a communication, we must use our feel, we must be sensitive before uttering what we'd like to share to other people. As an example, when we have our meals together with our friends and we feel like to go to toilet, it's not advisable to explicitly mention the word 'toilet' while our friends are having their meals. Say that we will say: "I got stomachache, wanna poop". Well, nothing wront syntactically and semantically. But see the context when we say so? Yes, it can make some people 'bring the image' of the toilet in their head, and consequently, they will loose their apetite. yeaaaaa.... Pragmatics is the most memorable lesson of our Thoritical Lingusitic class last week. Because it links directly into our daily life language as you said 'social context'. I already miss the class kak..